One time Krishna and Arjuna returned to Dwarka. Arjuna was handling the chariot, so when they reached Dwarka he was tired and went to the Guest House to sleep. After a while, Mother Rukmini came to Krishna and announced that food was ready. Krishna said that we have a guest at home and I will not eat till he is ready. So Mother Rukmini went to wake up Arjuna. When she got to his room, she was so surprised to see that each and every part, each and every pore of his body was chanting “Krishna Krishna” even as he was sleeping!!! Seeing this amazing sight, she got transfixed and started clapping her hands. Narada Muni showed up and told Krishna your food is getting cold; and then he went to wake up Arjuna. When he saw the same sight, he too got transfixed and started playing his Veena. 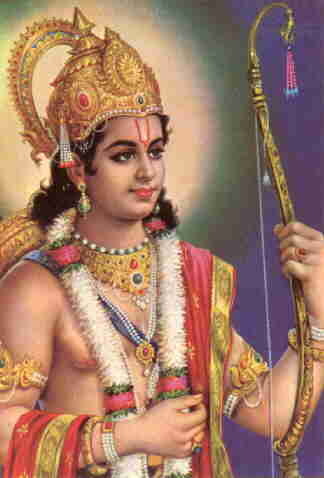 Satyabhama then came to call the Lord to eat, and then she said she will go wake up Arjuna. When she got to his room and saw him chanting in his sleep, Rukmini clapping and Narada Muni playing the Veena, she forgot about the food and started dancing. Finally Lord Krishna decided to go and wake up Arjuna himself. When He reached there and saw all of them, His heart started overflowing with love and He sat on the bed and started massaging the Feet of Arjuna. Arjuna woke up with a start and said Lord what are you doing????? The Lord said, you love me with each and every pore of your body, and this is why you are so dear to me! Saying this, He warmly embraced Arjuna!